1st Battery: Received in September 1863, with location of Vicksburg, Mississippi. This is probably correct, as the battery supported Sixth Division, Seventeenth Corps at this juncture. 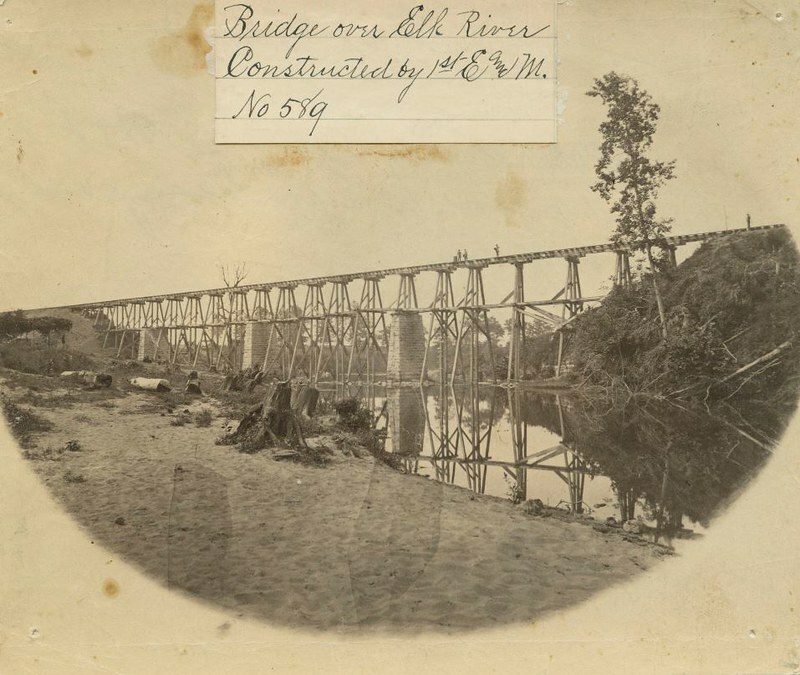 In fact, the battery would spend most of its time through the subsequent fall and winter around Vicksburg. The battery reported two 12-pdr field howitzers and two 3.67-inch (6-pdr) rifles. Captain William Z. Clayton commanded. 2nd Battery: For the second quarterly return in a row, we see Chattanooga, Tennessee as the location for this battery. Certainly valid for a posting date of January 1864. But as of June 30, 1863, the battery was assigned to First Division, Twentieth Corps, and active on the Tullahoma Campaign through middle Tennessee. Chattanooga was the objective, but not quite yet reached. Two 12-pdr Napoleons and four 10-pdr Parrotts were in the battery’s charge. Lieutenant Albert Woodbury remained in command. Woodbury would be mortally wounded at Chickamauga later in the summer. Lieutenant Richard L. Dawley did get the battery off the field, however. 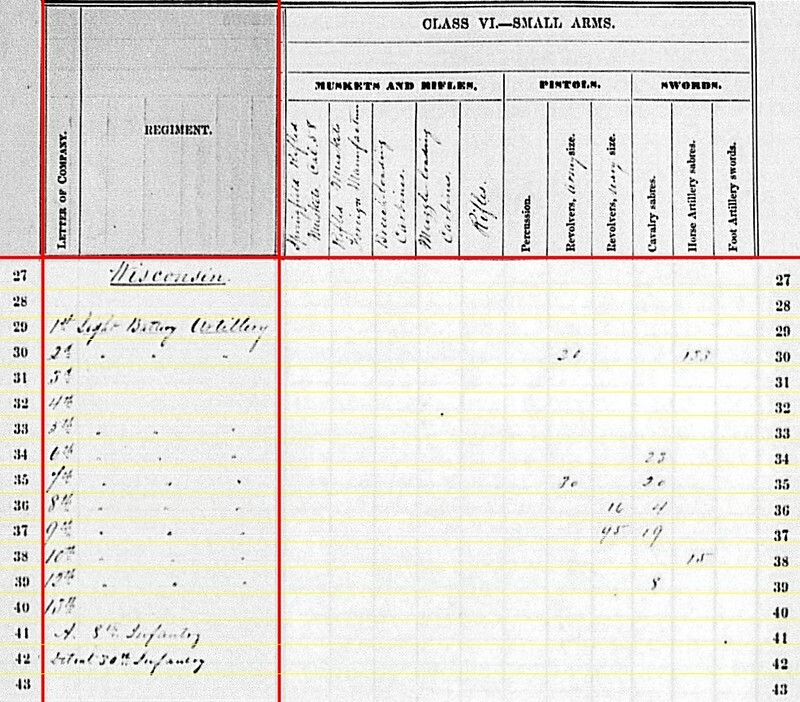 3rd Battery: Reporting from Fort Snelling, Minnesota with two 6-pdr field guns and six 12-pdr field howitzers (But… see note below). Captain John Jones commanded this battery assigned to the District of Minnesota, Department of the Northwest. Far away from the big battles in Mississippi, Tennessee, and Pennsylvania, the 3rd did not have a quiet summer by the lake. At the end of June, the Battery was among the forces on an expedition against the Sioux. 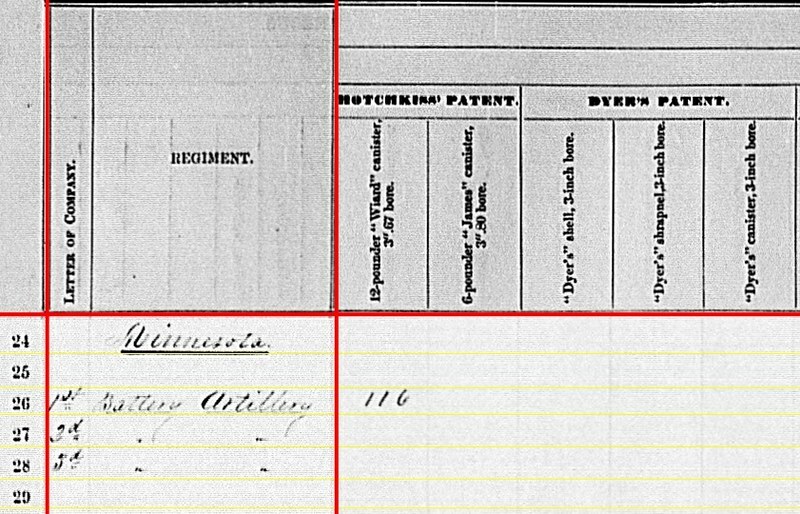 Lieutenant J. C. Whipple, commanding a section (of howitzers, if my memory is correct), served with distinction at Stony Lake later in July. Three batteries. Three different campaigns. No light duty for the Minnesota batteries. 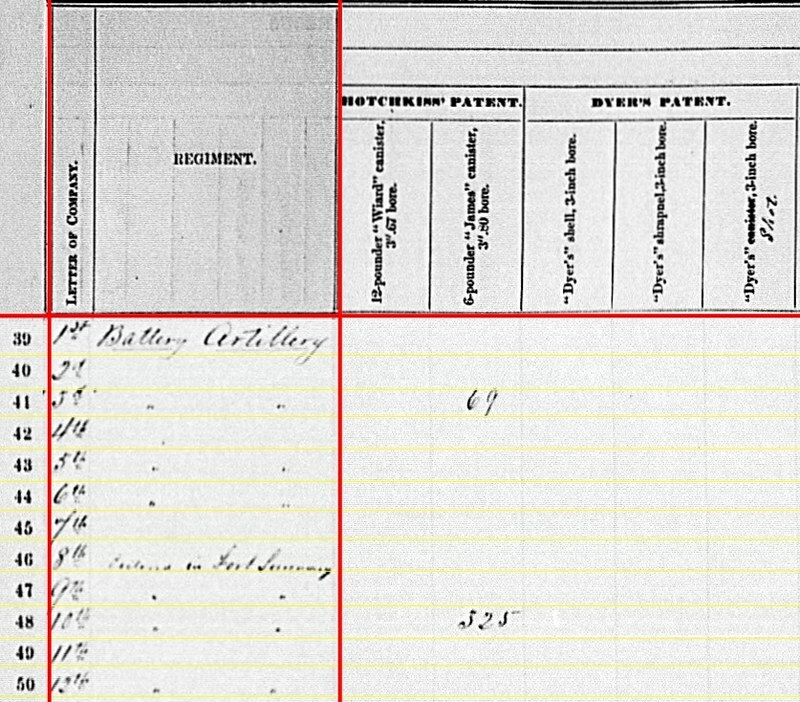 The 3rd Battery’s howitzers deserve some attention… or question marks, perhaps. 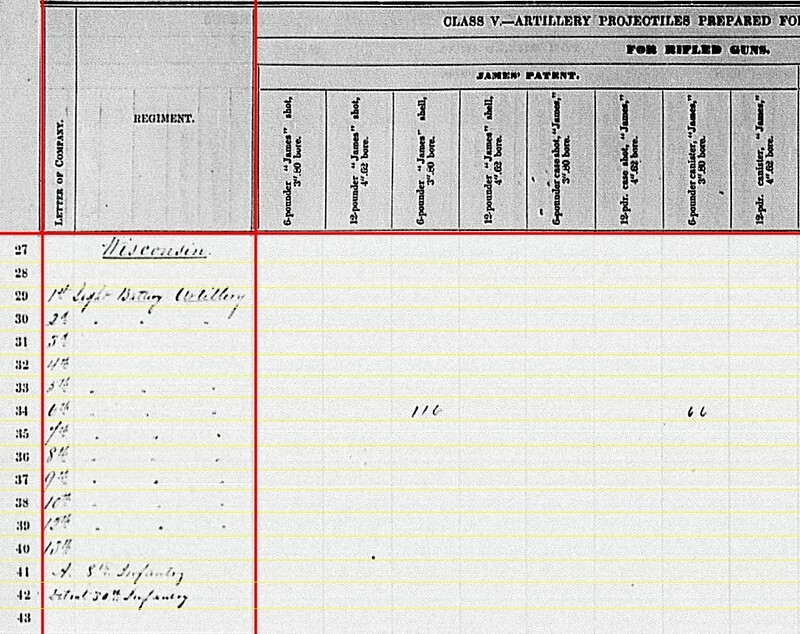 We see field howitzers on the cannon summary page. 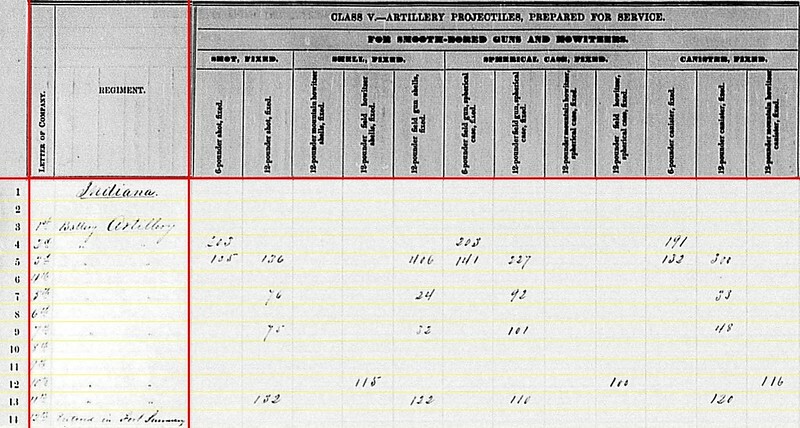 But later in the summary, we find the ammunition reported was for mountain howitzers. And Brigadier-General Henry H. Sibley, commanding the expedition against the Sioux, specifically mentioned a section of 6-pdrs and two sections of mountain howitzers in his official report. 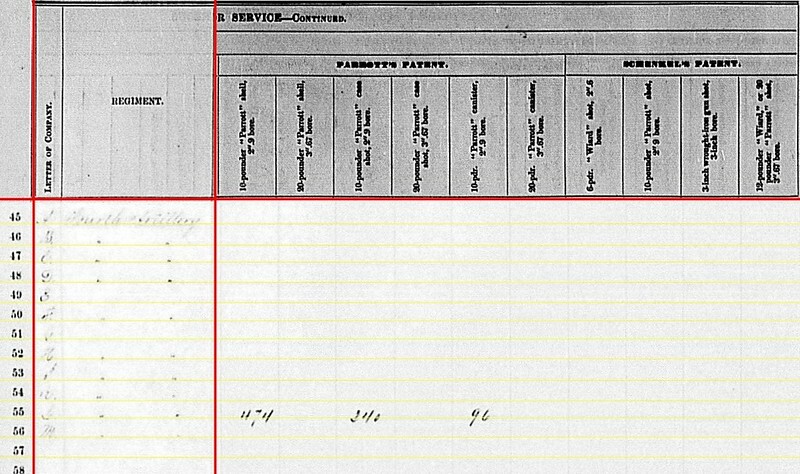 I would make the case for four mountain howitzers, and the tally being placed in the wrong column. 1st Battery: 74 shell, 128 case, and 90 canister for 12-pdr field howitzers. 2nd Battery: 96 shot, 32 shell, 96 case, and 32 canister for 12-pdr Napoleons. 1st Battery: 122 shot, 36 percussion shell, and 26 bullet shell for 3.67-inch rifles. 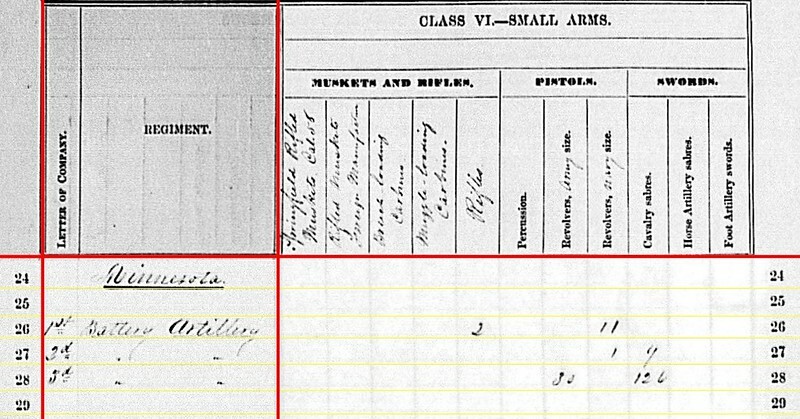 Note the Ordnance Department called this “Wiard” caliber, related to the rifled guns from that inventor. But we know that caliber pre-dated Wiard’s guns. 1st Battery: 116 canister for 3.67-inch. Again “Wiard” is the association, but we should properly disassociate from the eccentric inventor. 2nd Battery: 444 shell, 207 case, and 143 canister for 10-pdr Parrott. 1st Battery: Two rifles (type, non-specific) and eleven Navy revolvers. 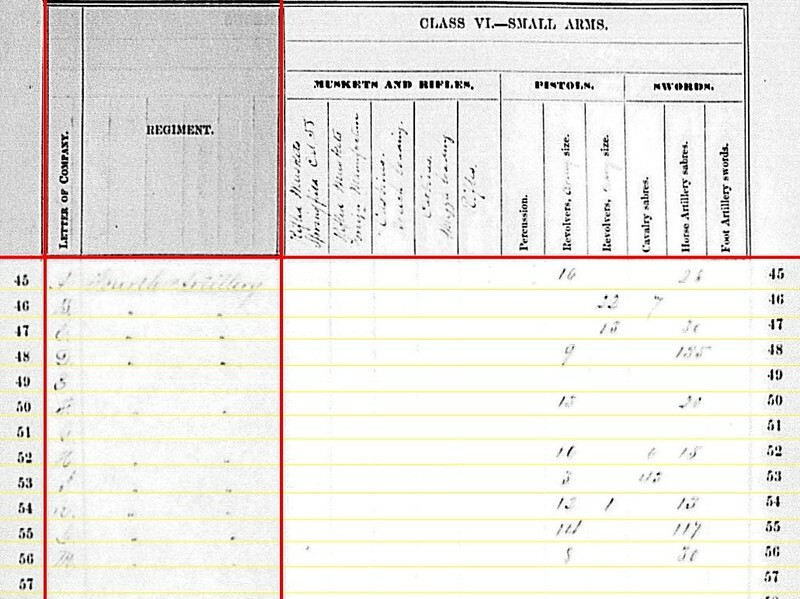 2nd Battery: One Navy revolver and nine cavalry sabers. 3rd Battery: Thirty Army revolvers and 126 cavalry sabers. 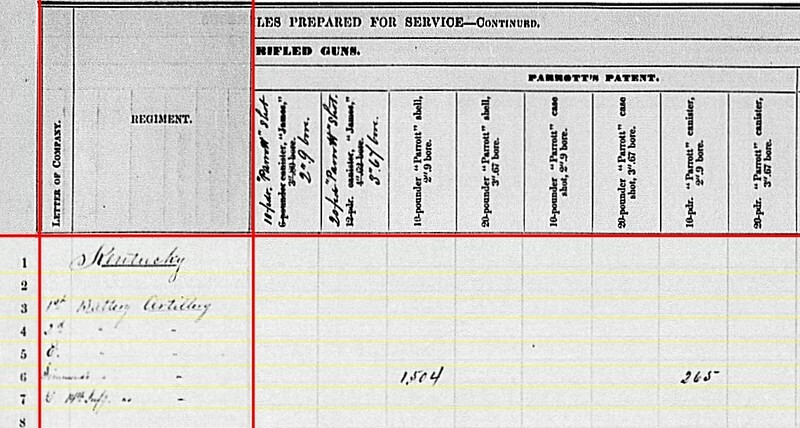 3rd Battery must have issued a saber to every man when stepping out on Sibley’s Sioux Expedition. 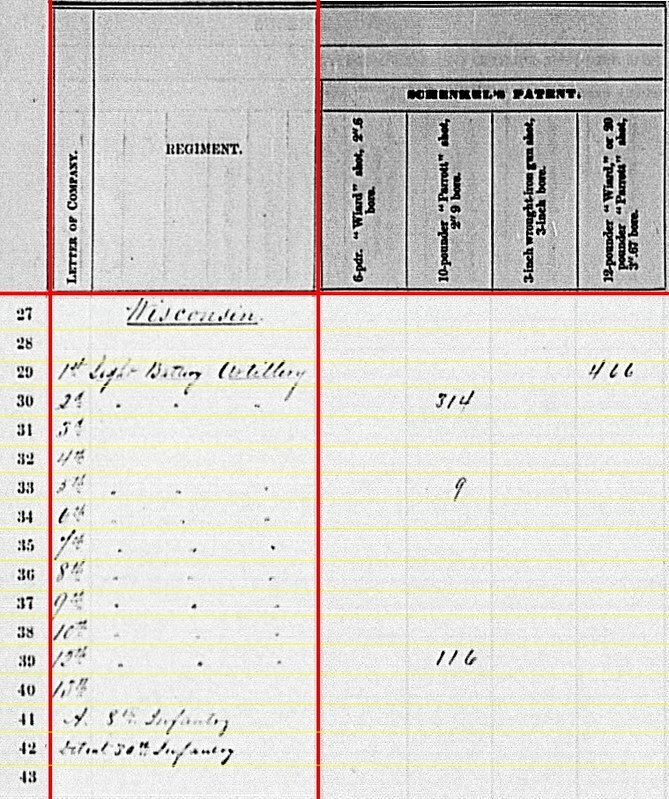 Looking ahead to the next installments, one might wonder “Where’s Michigan?” Well the clerks at the Ordnance Department, never ones to be constrained by the alphabet, shifted that state’s batteries to the next page. That gave room for all the batteries of Missouri to be considered in one contiguous group. Kentucky’s batteries appear with different designations across the various sources I have used to formally identify units. 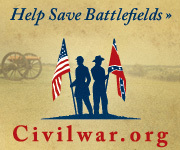 A good example is that organized and commanded through May 1863 by Captain David C. Stone. 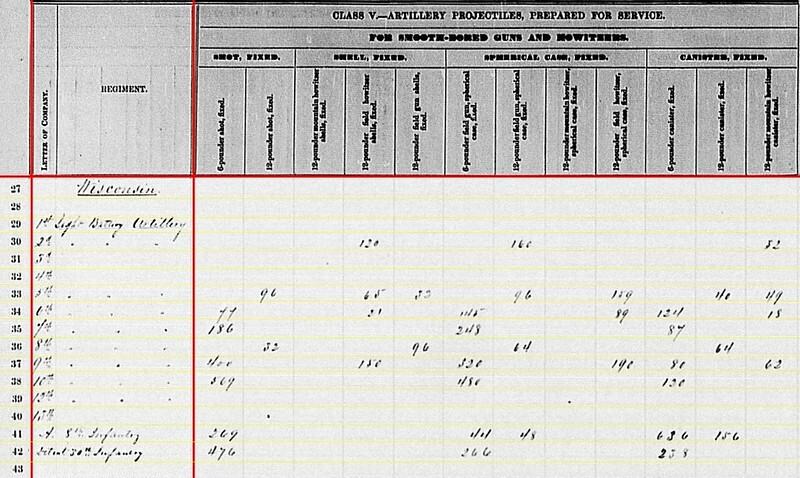 The battery appears on the Army of the Cumberland’s return for Stone’s River as “Kentucky, Battery A” which might also be transformed to “Battery A, Kentucky Light Artillery” or as the State Adjutant’s report, compiled post-war, indicated “Battery A, 1st Kentucky Light Artillery.” But later in 1863, the same battery, under the command of Captain Theodore S. Thomasson, appears in the Army of the Cumberland’s returns as “1st Kentucky Battery” (and there was, just below that entry a 2nd Kentucky Battery, so this was not simply a truncated version with the regimental designation retained). I’ve written on this before, for the previous quarters. But for those not tracking posts day-to-day (for shame! 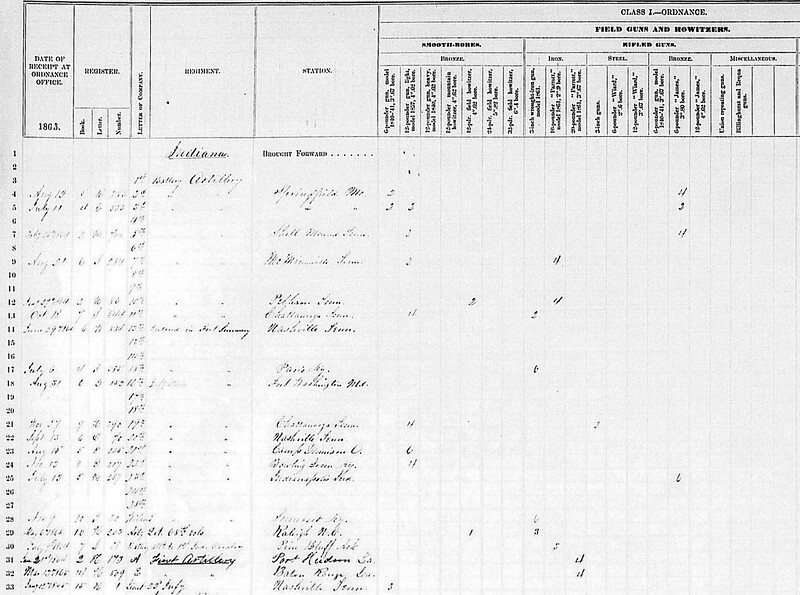 ), I bring this up again to preface the discussion of the batteries and their returns for the second quarter of 1863. 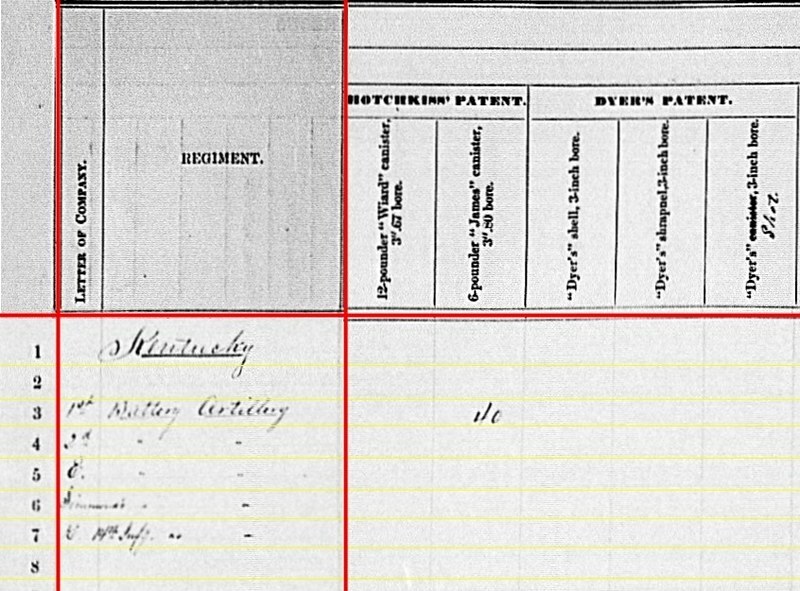 1st Battery: At Murfreesboro, Tennessee, with three(?) 6-pdr field guns, three(?) 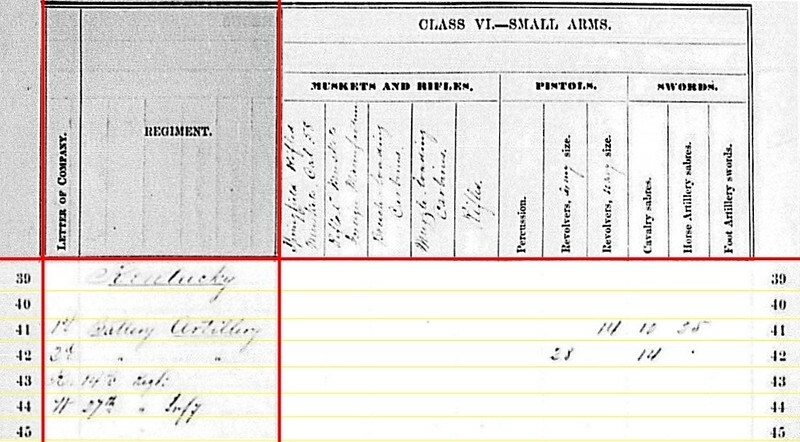 3-inch Ordnance Rifles, and two 3.80-inch James Rifles. 3rd Battery: At Gualey Bridge, West Virginia, with six 10-pdr Parrotts. 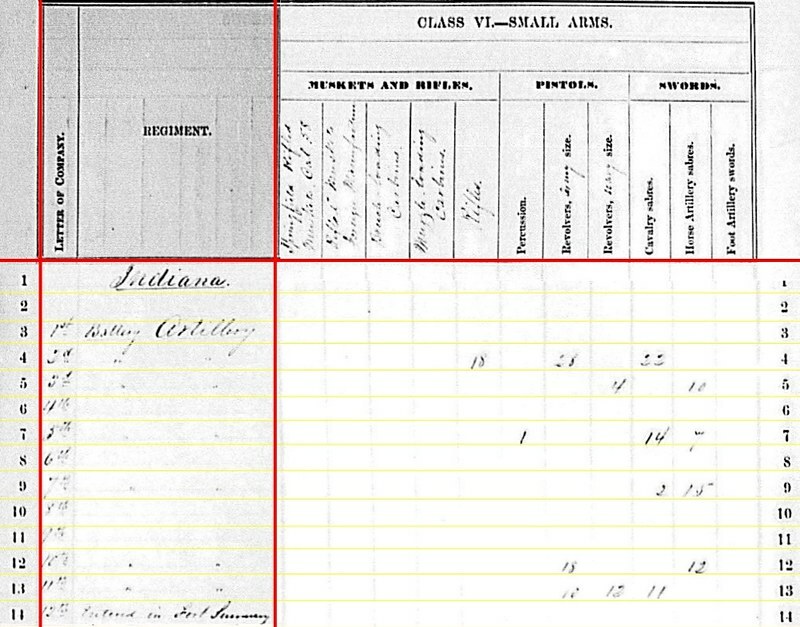 Company K, 14th Regiment: At Louisa, Kentucky with four 6-pdr field guns. 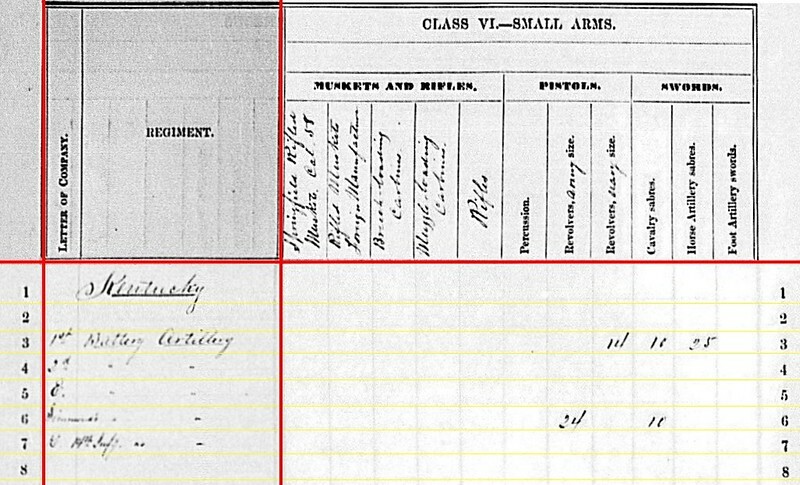 Company H, 27th Regiment, Infantry: At Munfordsville, Kentucky, with two 6-pdr field guns. Battery A, or 1st Battery: At Murfreesboro under Captain Thomasson. Placed in First Division, Fourteenth Corps when the Army of the Cumberland reorganized. But by June the battery was unassigned. 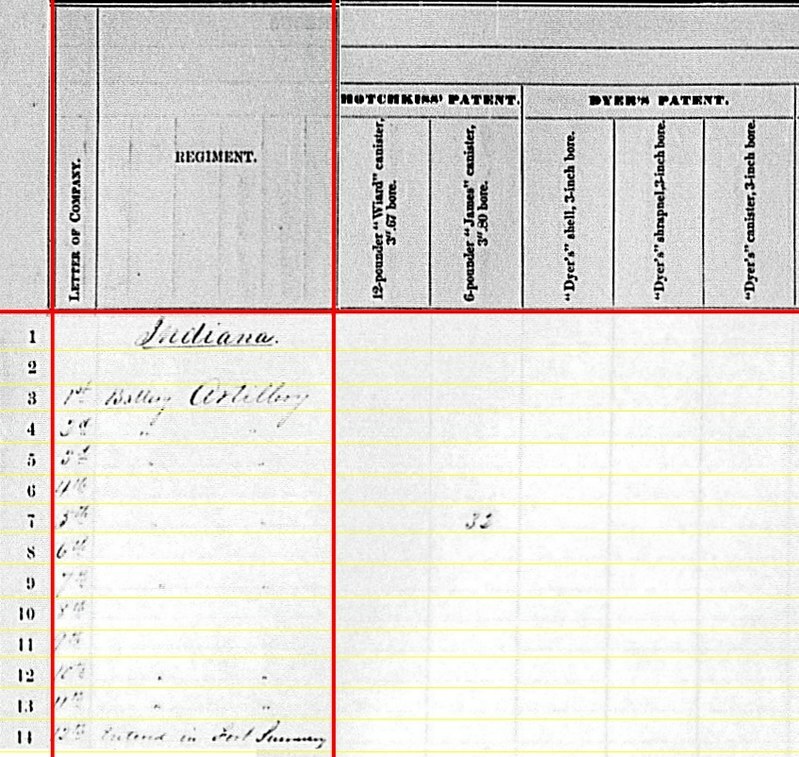 In May, Captain David C. Stone was relieved due to disability. It appears around that time the battery was detached from the division and remained in Murfreesboro. This should be the line marked “1st Battery” on the summary. Battery B, or 2nd Battery: Assigned to Second Division, Fourteenth Corps, under Captain John M. Hewett. The battery accompanied the division on the Tullahoma Campaign. There’s no reason the battery should be missing from the summary. But here we are. 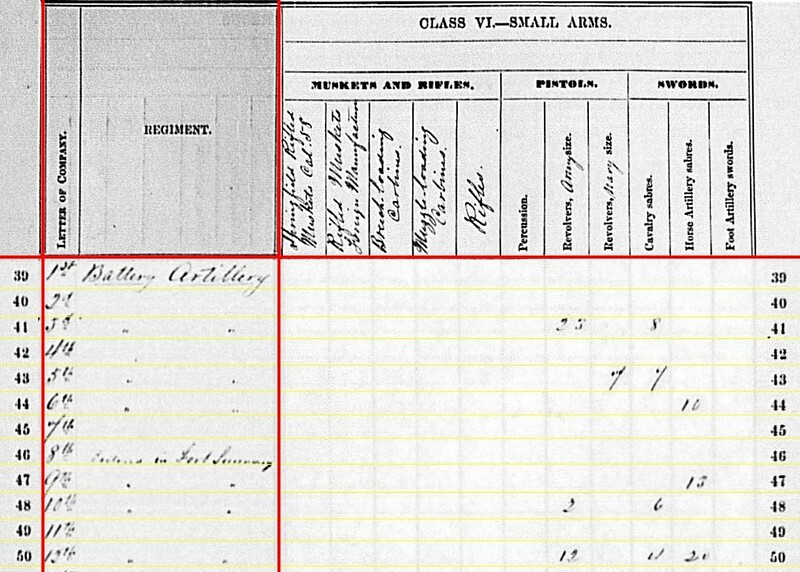 However, I would point out a listing of artillery complied from returns for the Army of the Cumberland indicated Hewett’s battery did not provide a return for the quarter. Battery C, or 3rd Battery: Authorized in May 1863, according to returns, this battery did not complete organization until September 1863. Captain John W. Neville would command. However a curious story-line which I have not completely confirmed places the battery, while still organizing, at Lebanon, Kentucky in July 1863. And Lebanon fell to Brigadier-General John Hunt Morgan on July 5, 1863, with most of the garrison surrendering, receiving parole. At any rate, this is not the 3rd Battery we see on the summary. 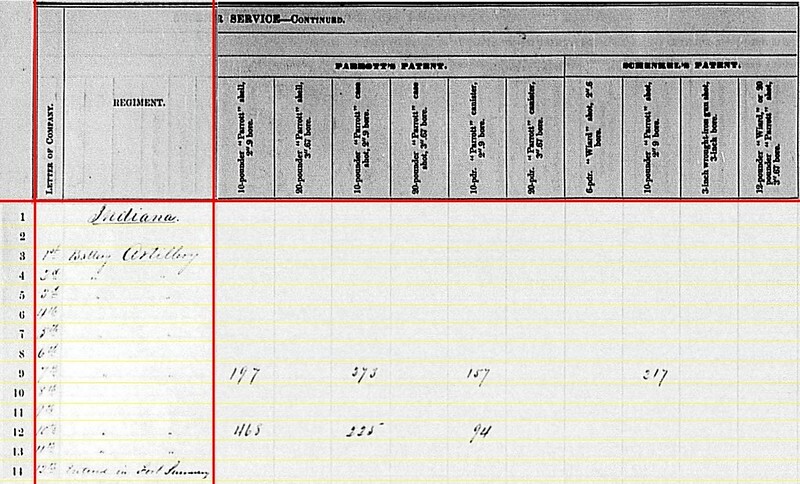 Simmonds’ Independent Battery, also 1st Kentucky Independent Battery: Captain Seth J. Simmonds commanded a battery formed out of Company E, 1st Kentucky Infantry. The battery served at Gauley Bridge and Kanawha Falls, West Virginia in June 1863. The battery became part of 3rd Division, Eighth Corps. This battery is probably that identified by the clerks as “3rd Battery.” This matches the armament and location given for the battery in the previous quarter. 14th Kentucky Infantry: The regiment was formed at Louisa, Kentucky in December 1861. And they returned home for a while during the winter and spring of 1863. The regiment was part of the Army of the Ohio. Colonel George W. Gallup commanded the regiment. But while he served as commander of the Louisa garrison, Lieutenant-Colonel Orlando Brown, Jr. was in charge. No further details that I know of regarding the four gun detachment. 27th Kentucky Infantry: This regiment was also part of the Army of the Ohio. And it was, as indicated on the summary, serving at Munfordsville, Kentucky in June. Colonel Charles D. Pennebaker was commander. But while he served as garrison commander, Lieutenant-Colonel John H. Ward served in his place. For clarity, allow me to identify the four lines using the clerks’ convention. But I will put my identification in parenthesis. 1st Battery (Battery A): 197 shot, 180 case, 111 canister for 6-pdr field guns. 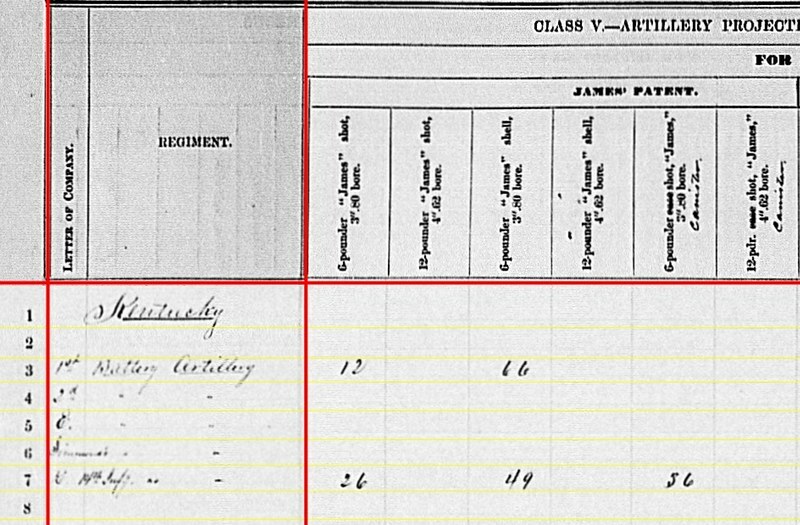 14th Infantry: 596 shot, 411 case, and 306 canister for 6-pdr field guns. 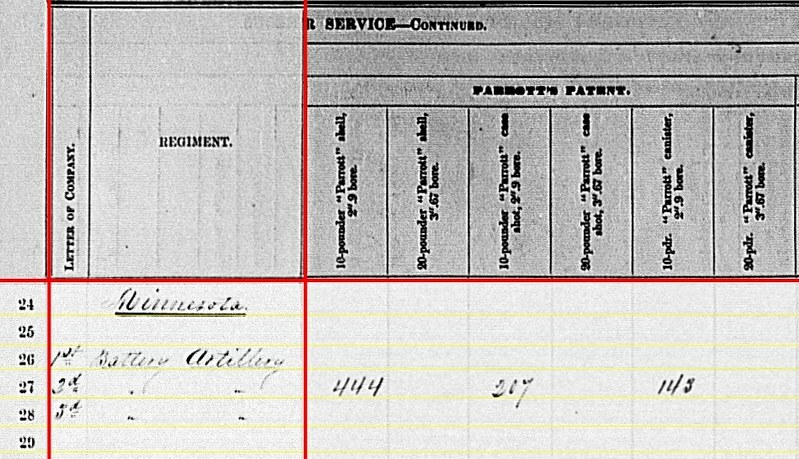 No indication what, if any, the 27th Infantry had on hand. There are no Hotchkiss projectiles reported on the first page. 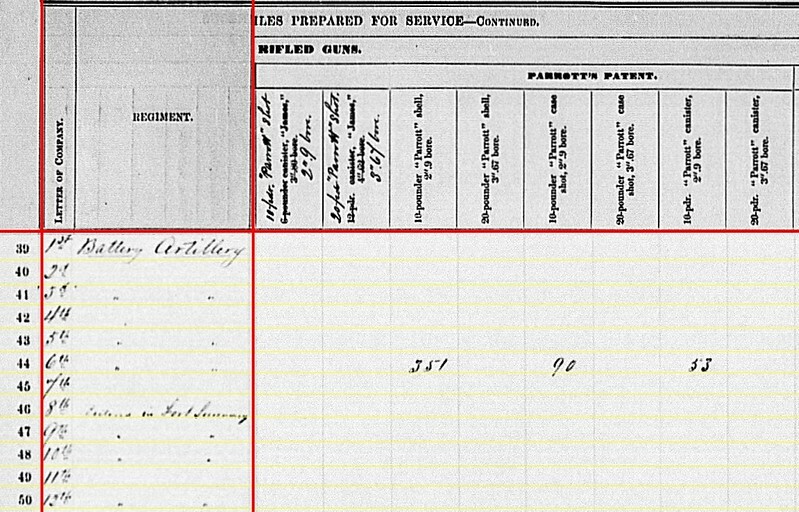 That is notable, as the 1st Battery/Battery A had 3-inch rifles on hand. So no rounds reported to “feed” those guns. 1st Battery (Battery A): 40 Hotchkiss canister for 3.80-inch James rifles. 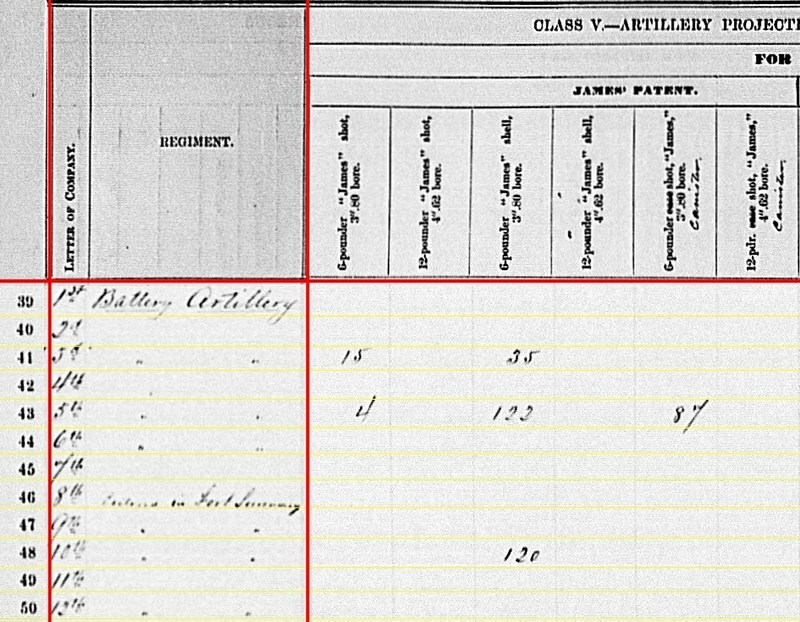 1st Battery (Battery A): 12 shot and 66 shell for 3.80-inch James rifles. 3rd Battery (Simmonds’): 1027 shell, 575 case, and 265 canister for 10-pdr Parrott; and 69 Schenkl shot for 10-pdr Parrott. 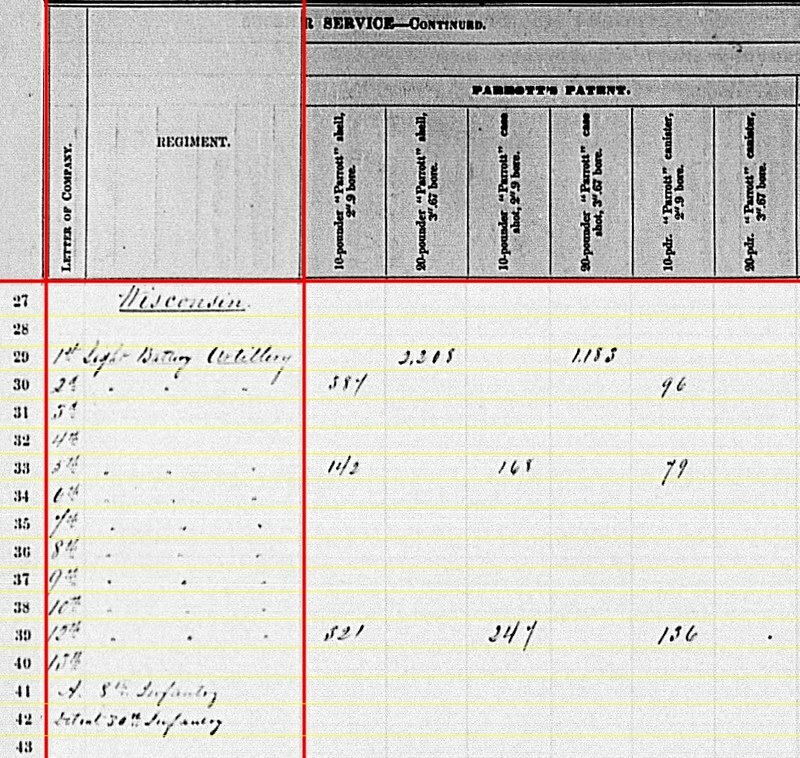 Simmonds’ Battery reported a substantial stockpile of ammunition the previous quarter, keeping with the trend. 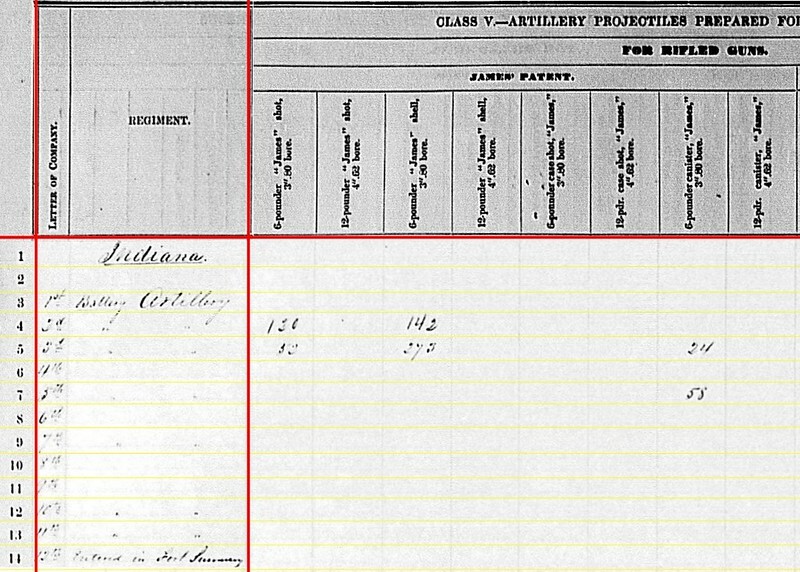 1st Battery (Battery A): 250 Schenkl shell for 3.80-inch rifles; 110 Tatham canister for 3.80-inch rifles. So, in all a few gaps to question, particularly the 3-inch ammunition for 1st Battery/Battery A. Otherwise nothing stands out to argue with. 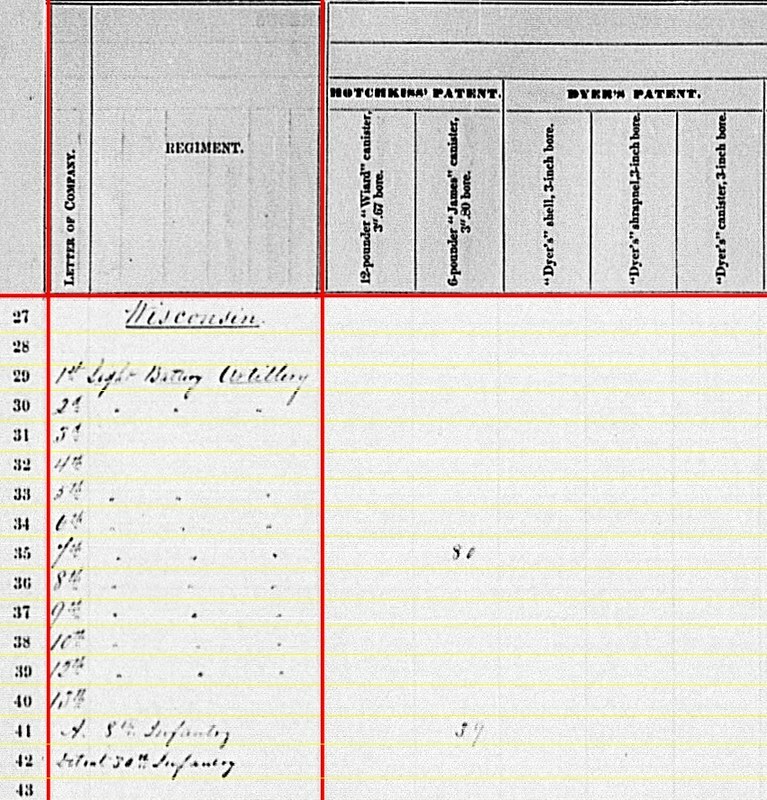 1st Battery (Battery A): Fourteen Navy revolvers, ten cavalry sabers, and twenty-five horse artillery sabers. 3rd Battery (Simmonds’): Thirty-eight Army revolvers and fourteen cavalry sabers. That concludes a toiling translation of four lines of the summaries. I don’t like all the guesswork, but that is unfortunately where the trail runs.